In early 2018 I wrote on Livewire that the year ahead would be a mixed bag for housing, as tightness in markets like Hobart contrasted the negative outlook for Sydney, which appeared to be at a market-top. As the year played out, a number of the concerns raised came to the forefront of the property discussion. As a result, the team at Livewire got in touch and asked me to update my views on the housing market. In this exclusive article, I share my take on what happened in 2018, what's changed significantly in the past 12 months, the two key drivers that matter for housing this year, and finally, my estimate for how far Sydney and Melbourne property could fall. When I wrote the previous wire in January 2018, it had become evident that credit was being squeezed. I was especially concerned at that time with a potentially high volume of switching across from P&I to interest-only mortgages, a market risk that wasn’t widely discussed or well understood back then. That’s certainly changed dramatically, with both the stock and flow of interest-only loans plunging to multi-decade lows as 2018 progressed. The regulator evidently pushed this point much harder than most people had expected. Thankfully the reset has not led to any meaningful moves in mortgage arrears, at least for the time being, other than a relatively modest increase in interest-only arrears on the books of some lenders. 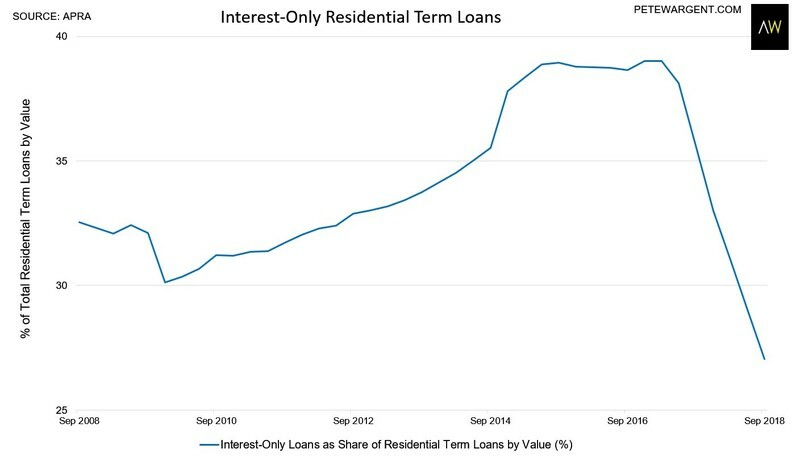 The glut of interest-only loans has been decisively tackled, but it’s worth noting that the drag on consumption may continue for some time to come, even if the borrowers that switched across to P&I are paying a lower mortgage rate than they were before switching. Through most of 2018 it seemed likely to me that regulators would’ve been quite happy with the cooling of the housing markets. But as the calendar year drew towards its close, transactions in the market were dropping away rapidly, and more concern was expressed about the need for credit to continue flowing. Mortgage processing times were blowing out as the Royal Commission created a great deal of uncertainty and a level of fear about what was expected of lenders, especially in terms of the cross-checking of household expenses. Plain vanilla mortgages were at times being treated like forensic audits such was the paranoia, and mortgage lending dropped off quite sharply, especially to investors. As property buyers we saw first-hand examples of investor loans being refused point blank for apparently inexplicable reasons in some cases, and settlement risks are now increasing, especially for new and off-the-plan properties. I noted in January 2018 that not enough consideration was being given to the ALP’s proposed changed to negative gearing and capital gains taxes. I think it’s fair to say that’s also now changed (and how! ), with negative gearing being a regular point of contention, both between the political parties and in the media. Have the credit taps been loosened? Beyond January 2018 credit conditions tightened quite considerably as the Royal Commission hits its straps. Initially the impact was mainly on investor loans, following APRA’s practice guide APG 223 and some related caps on credit growth. But as we discussed in a joint report on the impacts of proposed negative gearing changes with RiskWise Property Research, investors now tend to amplify market cycles, and as the year progressed owner-occupier approvals began to trend lower too as sentiment waned. Of course this is a macro observation, and admittedly some markets such as Hobart, Geelong, and several regional markets fared far better than Sydney and Melbourne in 2018. But overall the main change was a significant tightening of borrowing capacity and credit availability through 2018. With the Royal Commission final report now having been released in early February, the most pressing question is whether credit taps are now set to be loosened a little. At the time of writing there is still a high level of apartment supply to be absorbed, but the pipeline is now set to shrink rapidly, especially for unit developments in Sydney, Melbourne, and Brisbane. 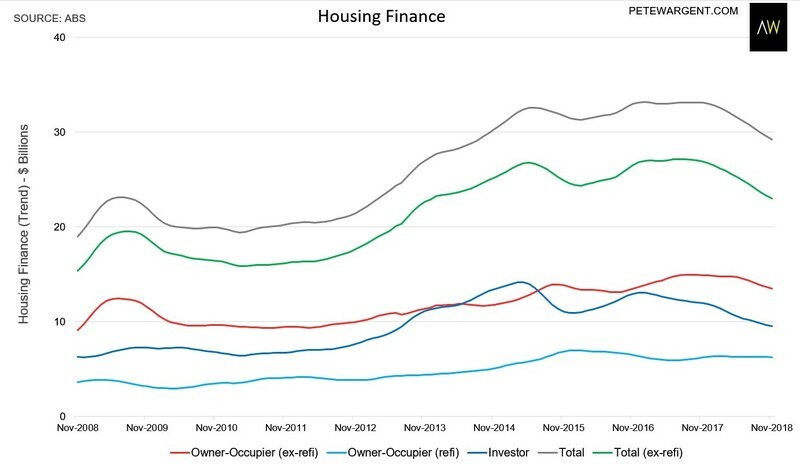 There is widespread evidence of developer discounting of new stock, which should help to clear the glut, assuming borrowers are able to access credit. The biggest driver, in a word? Credit. At the time of writing the Royal Commission final report has only just been released. The findings will largely have been a relief to the major banks, with the blowtorch being turned on financial advisors and mortgage brokers, but with relatively little new to add on responsible lending laws. If implemented, the proposed changes to mortgage broker remuneration would reduce competition and see major banks regaining market share, but any such recommendations may not be implemented in full (and even if they were there would be a stay of execution). Another interesting trend to watch will be in construction. In the Livewire post in June 2018 Requiem for a construction bubble I noted how the elevated levels of construction couldn’t be sustained. 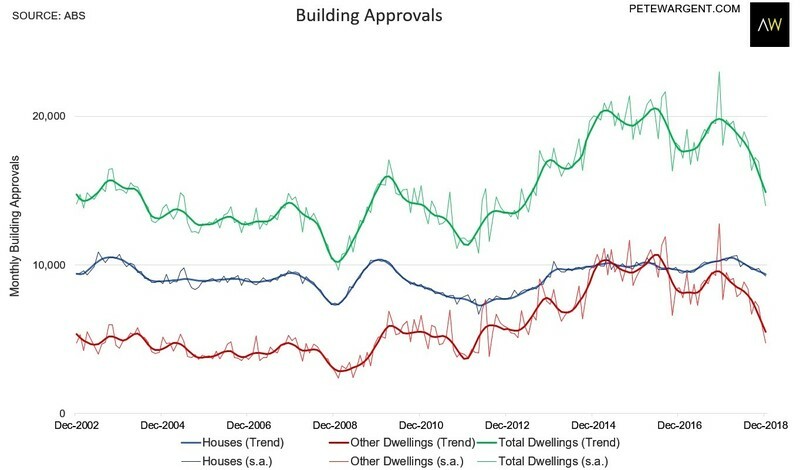 Since June monthly approvals have nosedived from around 19,000 to under 14,000, which represents a remarkably fast rate decline, largely driven by apartment approvals in the major capital cities. Notably these figures are before the impact of some high-profile apartment tower news stories, and Labor’s proposed changes to negative gearing, which would be a net negative for investor demand (although benefits are due to remain on new dwellings). The big question: Where to from here? After reviewing the Royal Commission report, my base case would still be for further declines in Sydney and Melbourne in 2019, even if the appetite for lending returns a little as the year progresses. That’s not least because election years rarely inspire confidence at the best of times, and this time around the opposition has proposed some significant changes to the way in which housing is taxed. Gross rental yields in many parts of Sydney and Melbourne had fallen as low as 3%, far too low to be acceptable for an investor under the ALP’s proposed changes to negative gearing. Yields have lifted to about 3½ per cent, which is mainly a function of changes in price rather than rising rents, although we are clearly seeing increased competition for house rentals in the popular suburbs of Melbourne with fewer landlords and homebuyers now entering the market. But still, gross yields in those cities would need to be above 4 per cent under the proposed new policy for negative gearing, and so that correction has a way to travel yet. There is also far more stock on the market in Sydney and Melbourne than was the case a year earlier, so the environment has become far more favourable for buyers. I expect most of the other capital city markets will likely record relatively flat prices, having not experienced the preceding boom (Hobart now excepted). At first blush the recommendations of the Royal Commission report in themselves don’t appear likely to tighten credit conditions further. The above points having been said, market median prices only tell a part of the story. And to be blunt anyone that bought an off-the-plan apartment in some of Sydney’s most supply-responsive sub-regions would be very nervous right now, and possibly facing a valuation shortfall at settlement (potentially even facing negative equity thereafter). The same may hold true in pockets of Melbourne, and certainly in the CBD of Brisbane. A-grade properties around the median price in the more supply-constrained markets have generally held up better, but the upper price quartile of the market has absorbed some significant price declines in many cases. Base case: peak to trough declines for Sydney and Melbourne of about 15 per cent, but as always there are many more moving parts to the housing markets than a median price change. Queensland,the introduction of "Project Building Accounts" for contracts over $1,000,000.... This will be interesting. A well researched and useful article to assist in rating risks of entry into property related investments.